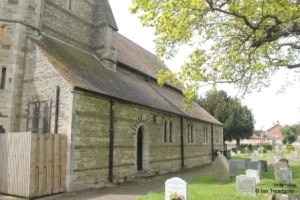 The church of St John the Evangelist in Moggerhanger is situated on the Blunham Road to the north of the main east-west Bedford Road in the centre of the village. 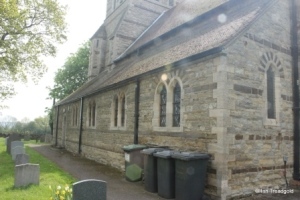 Parking is available either on the road outside the church or in the grassed parking area for the recreation ground to the south of the church. 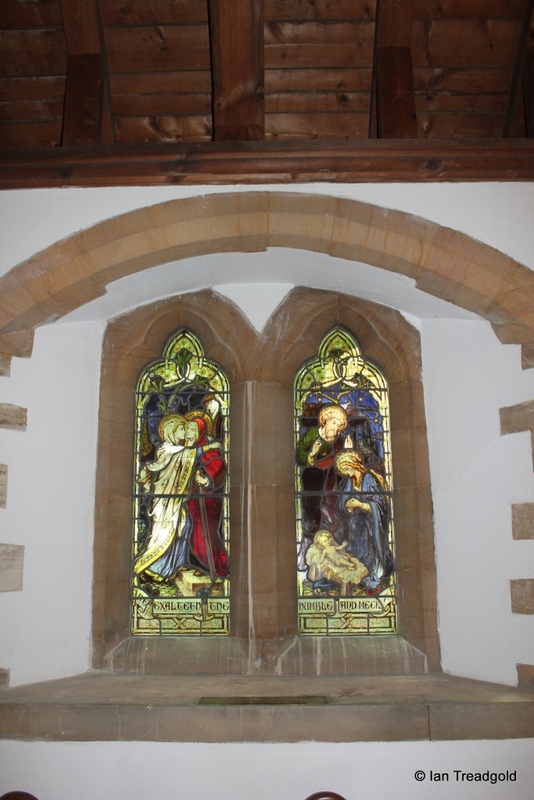 The church is relatively modern, dating from the middle of C19. 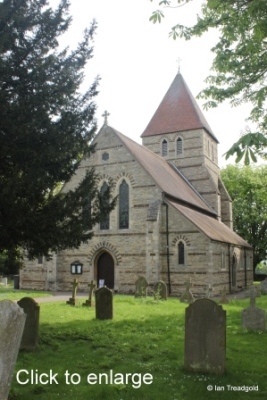 Originally part of Blunham parish, the development of the village and its distance from the church in Blunham necessitated a new church in the village. 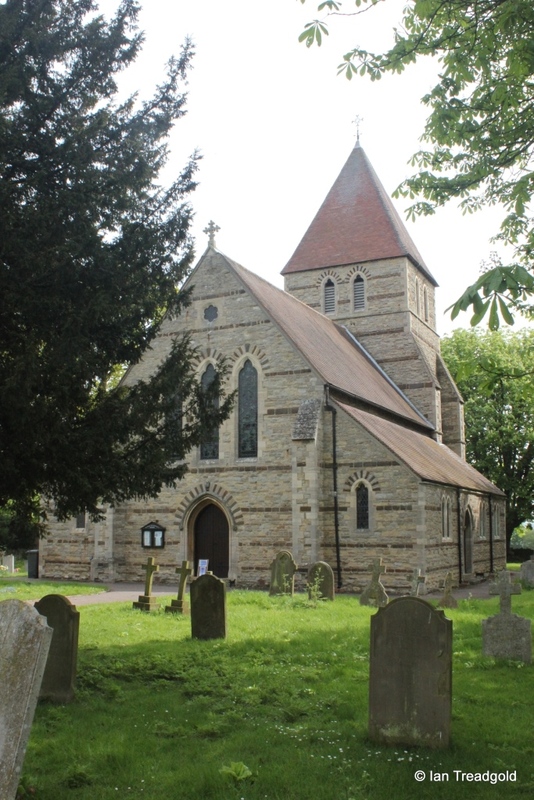 The church was built by Elizabeth Dawkins in 1859 in memory of her husband the Reverend Edward Henry Dawkins. 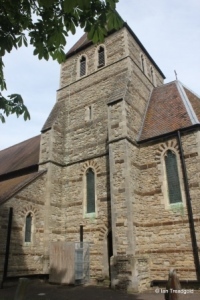 Consecrated in 1860, the church gained parish church status later that year when Moggerhanger became a separate ecclesiastical parish. 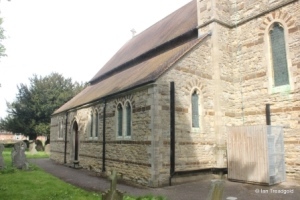 The church is built in a Norman style with simple round arched lancet windows throughout. 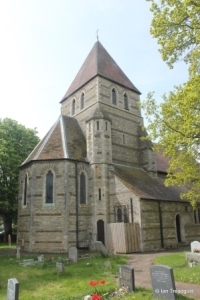 It has an apsidal chancel, nave, north and south aisles with a crossing tower. 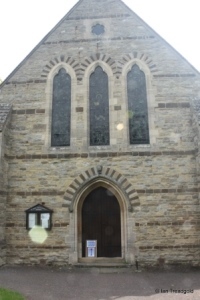 The main entrance Is at the west although there is an unporched door to the south. 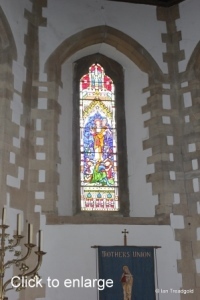 The crossing tower is buttressed to north and south and has a trefoiled single light window to the south under a Norman arch. 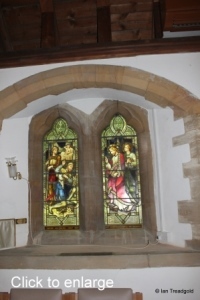 The belfry lights are of two separate single lancet windows on each face of the tower. 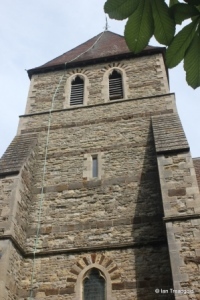 The tower roof is formed of a simple four-sided pyramid. 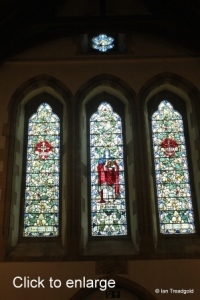 The south aisle has single lancet windows to the east and west with three sets of paired lancets surrounding the south door. The glass in the east window of the south aisle is in memory of Jeremiah Titmas whod died in 1888 and is over an altar in the south aisle. 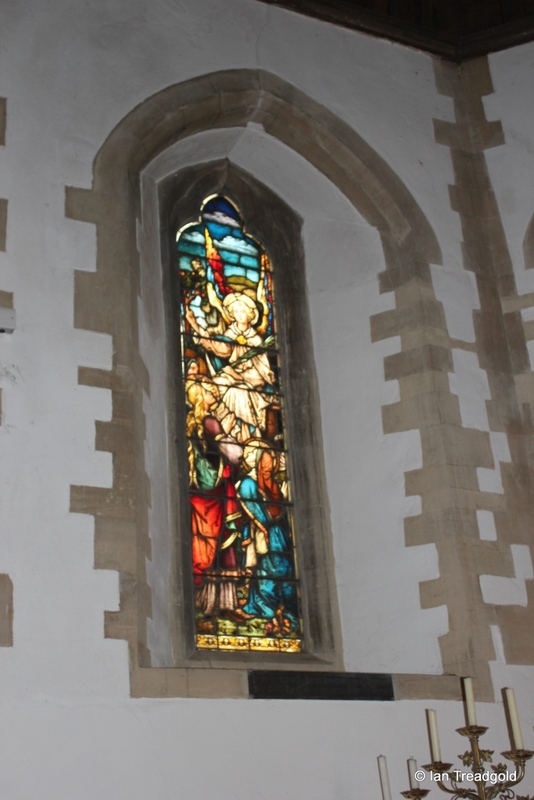 The western window in the south aisle is dedicated to the memory of Emma Thornton who died in 1860. 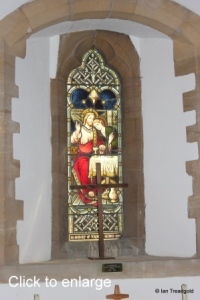 The Thornton family had lived at Moggerhanger Manor prior to the Dawkins family. 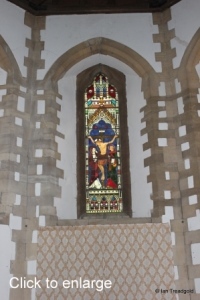 The two eastern windows in the south aisle depict scenes from the life of Christ. 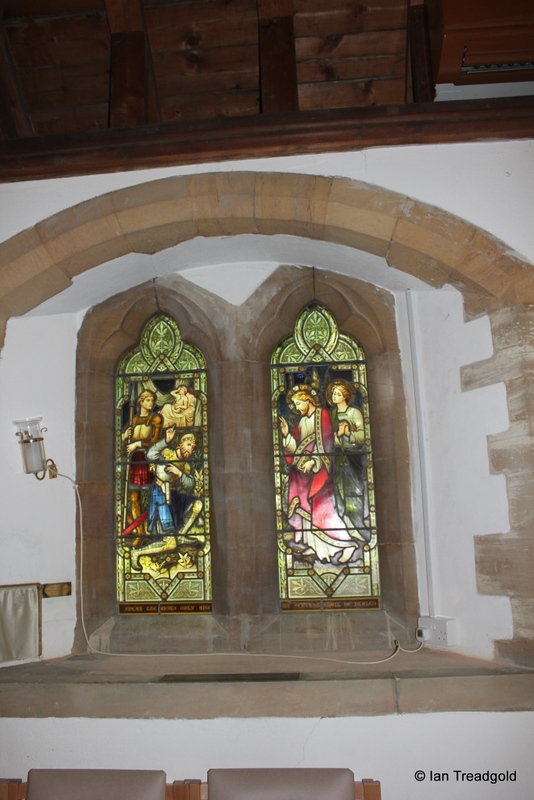 The west end of the church has a west window of three tall conjoined lancet windows each under a Norman arch. 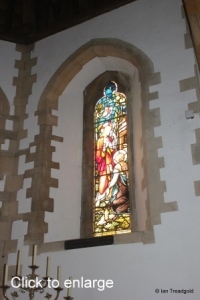 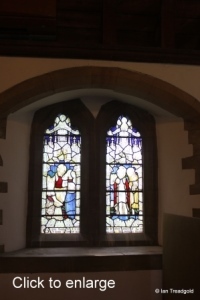 The glass in this window , depicts the virtues of Faith, Patience and Hope and is dedicated to Edward Dawkins who died in 1912 and is wife Louisa Dawkins who died in 1907. 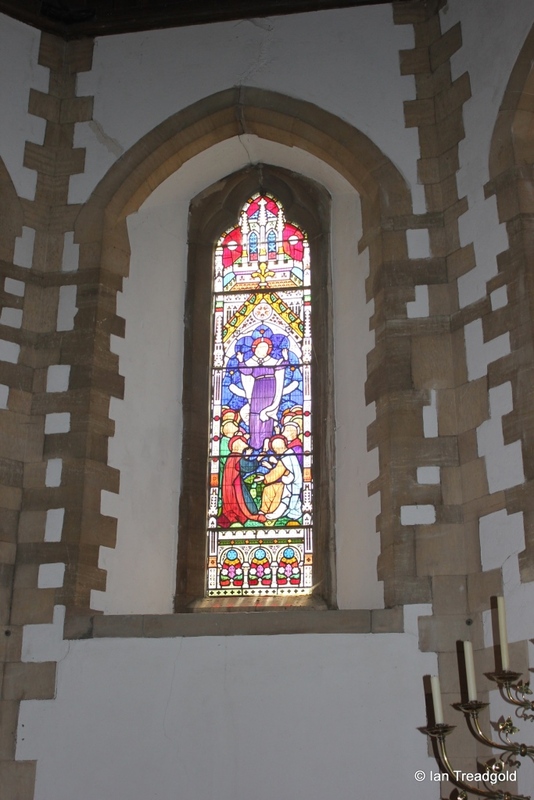 The north aisle has a window to the west and four sets of two lancets windows along the north side. 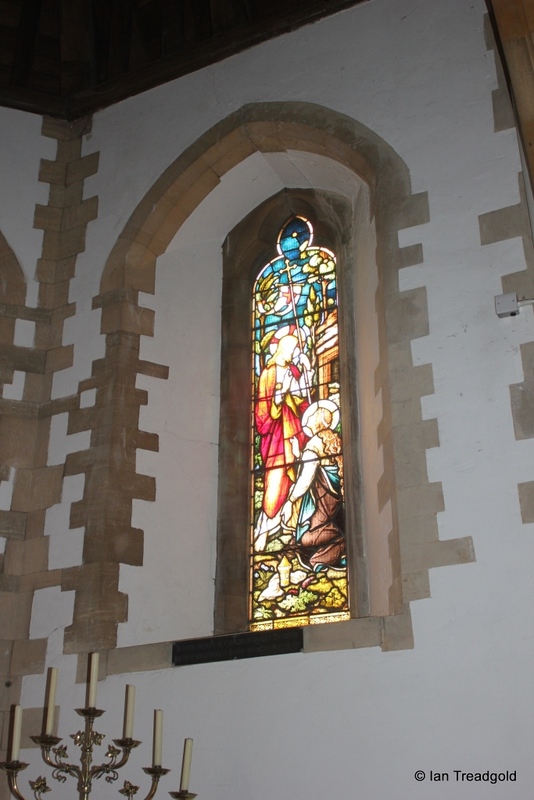 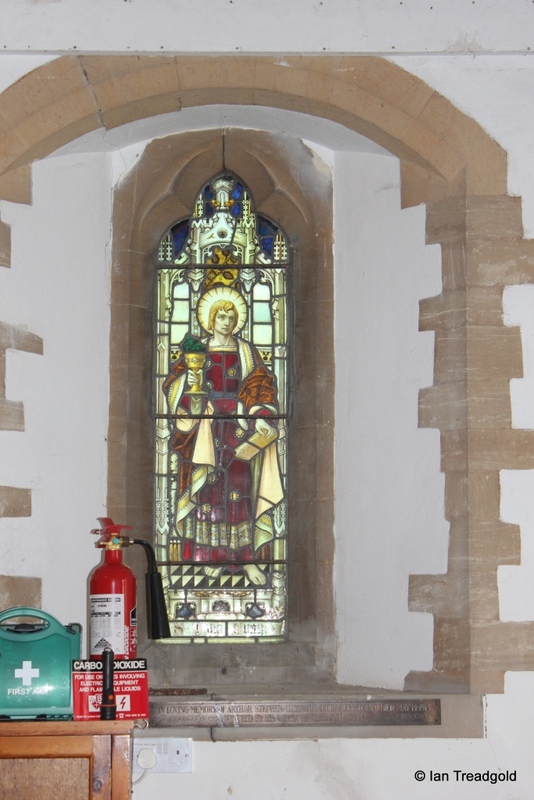 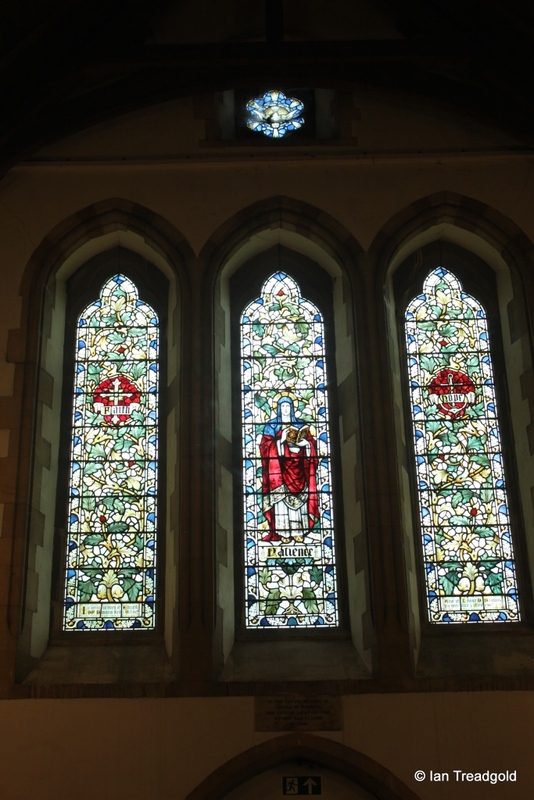 The glass in the west window depicts the patron of the church, St John the Evangelist. 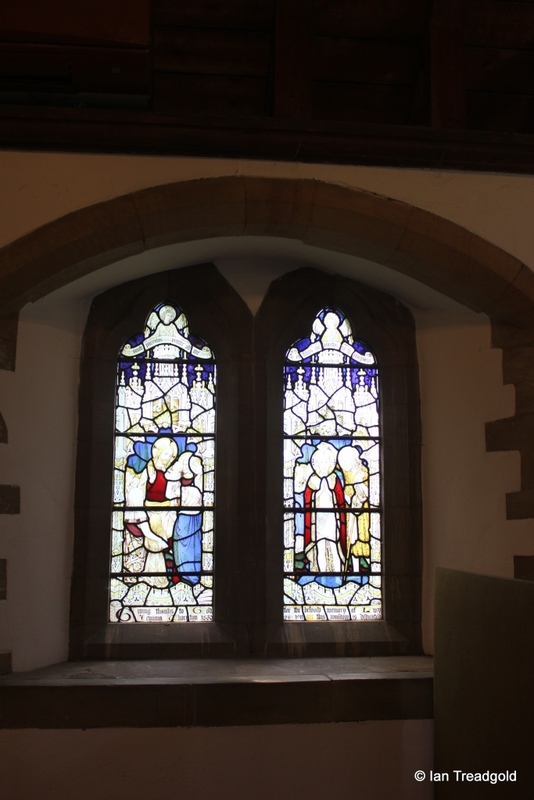 The north aisle also has a door to the vestry with the aisle and vestry having been extended against the tower. The octagonal stair turret nestles between the vestry and the chancel. 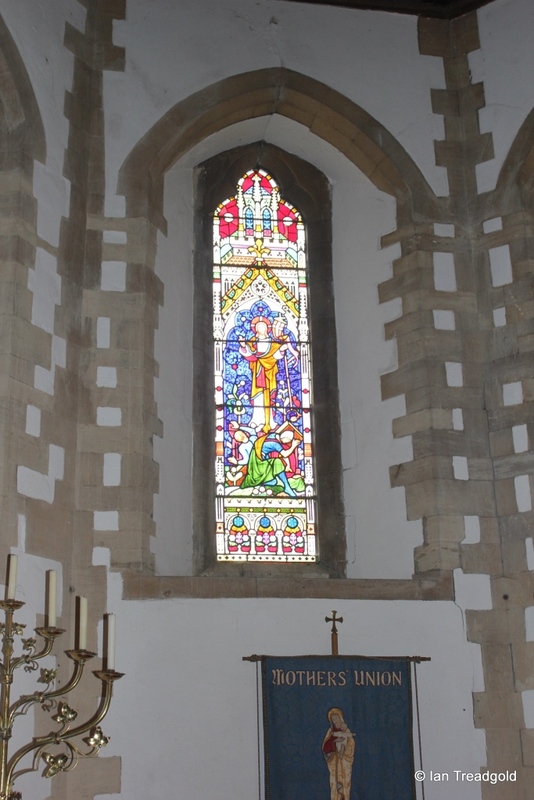 The chancel has five windows; one each to the south and north and three behind the altar. 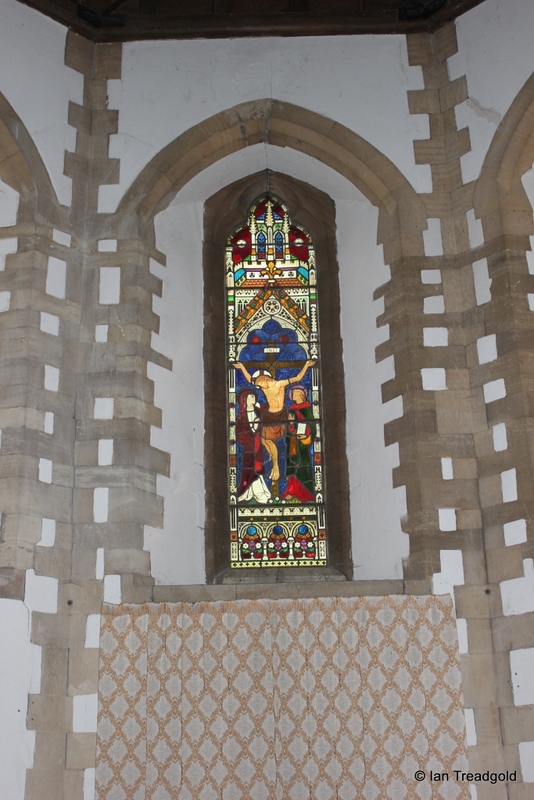 All five depict scenes from the life of Christ with the eastern three showing the Crucifixion, Resurrection and Ascension. 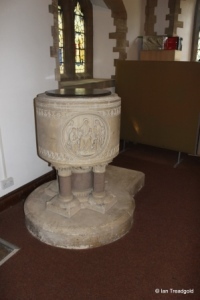 The imposing carved circular stone font is situated by the south door.